We’re back on the track of the un-sung classics hidden in the Ullapool hinterland. 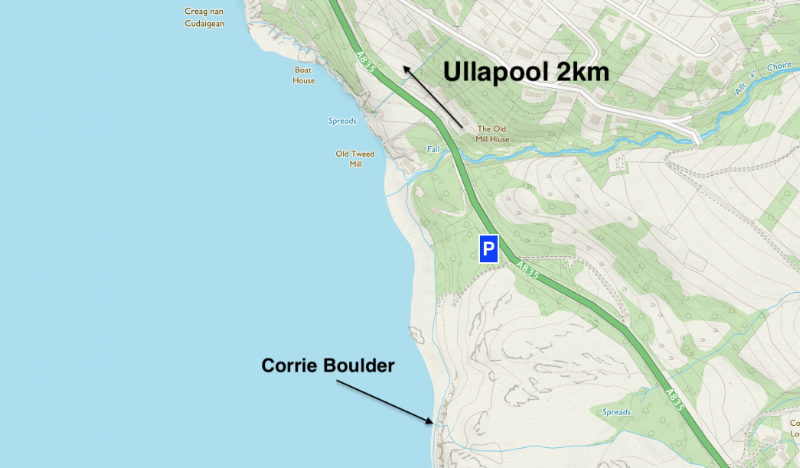 It’s about 2km east of Ullapool. Park carefully at the gate on the south side of the A835, follow the track down to the beach, turn left and scramble along the shore for a short way. There’s a few details that make this one stand out. Firstly it’s a wacky little spot by the sea with a nice water feature. Also the rock isn’t the normal Torridon sandstone you get in these parts. Due to it’s proximity to the Moine Thrust there’s been some metamorphosis going on and it might seem a little weird. Lastly the access is tidal; you’ve got about an hour either side of low tide. The grade is 6Cish but quite high, don’t fall off the top.